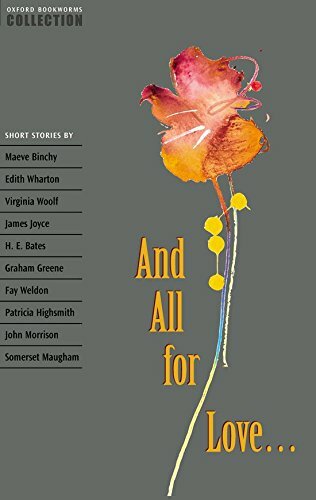 Stories by Maeve Binchy, Edith Wharton, Virginia Woolf, James Joyce, H.E. Bates, Graham Greene, Fay Weldon, Patricia Highsmith, John Morrison, Somerset Maugham look at human relationships and some of the sad, appalling, or surprising things that are done in name of love. What sad, appalling, and surprising things people do in the name of love and for the sake of love. These short stories give us love won and love lost, love revenged, love thrown away, love in triumph, love in despair. It might be love between men and women, children and parents, even humans and cats; but whichever it is, love is a force to be reckoned with. This collection contains stories by Maeve Binchy, Edith Wharton, Virginia Woolf, James Joyce, H.E. Bates, Graham Greene, Fay Weldon, Patricia Highsmith, John Morrison, and Somerset Maugham.